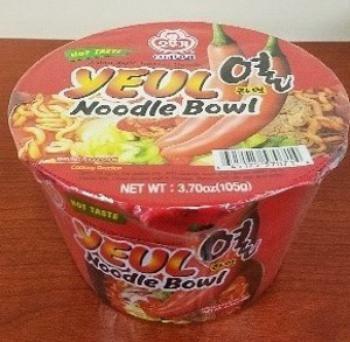 Ottogi America is recalling 21 noodle items that may contain egg, an allergen not declared on the label. 21501202 JIN RAMEN SPICY 4.23oz x 20ea FROM "BEST BEFORE JAN.15.2019" TO "BEST BEFORE NOV.20.2019"
21101009 RAMEN NOODLE SARI 110G 3.88oz x 48ea FROM "BEST BEFORE JAN.15.2019" TO "BEST BEFORE NOV.21.2019"
21309009 RAMEN BOKKI(BOWL) 4.23oz x 12ea FROM "BEST BEFORE JAN.15.2019" TO "BEST BEFORE JUL.21.2019"
Some of the above items were recalled by the Canadian Food Inspection Agency. Customers who purchased the recalled products may return them to the place of purchase for a full refund.